If you could have just one rifle to slay varmints, hunt white-tails, shoot paper at long range, and duel in tactical matches, it would be hard to beat the .243 Winchester. This versatile "little brother" of the .308 Winchester is a true triple-threat as a match cartridge, varmint cartridge, and game cartridge. With 115gr DTAC bullets, a .243 rivals a 6.5-284 ballistically out to 1000 yards. Shooting 80-100 grain hunting bullets, a .243 will anchor a buck with authority. Driving the light 55-75 grain pills, the .243 provides the flat trajectory and high impact energy varminters love. As a tactical round, the .243 is one of the best, offering excellent ballistics, moderate recoil, and stone-reliable feeding from a detachable magazine. The .243 Win excels with a wide variety of powders, and excellent factory-loaded hunting ammunition is available. Off-the-shelf .243 rifles from Howa, Remington, Savage, and Tikka perform admirably with little or no modification. The "improved" version of the cartridge, the .243 Ackley, can do everything its parent can do, with more velocity, and greater brass stability thanks to its 40° shoulder. Among the Ackley variants, the .243 AI is rightly one of the most popular. It is easy to fire-form, and commercial dies are readily available. Barrel life is the downside of both the .243 AI and standard .243. These chamberings pump a lot of powder through a small bore. 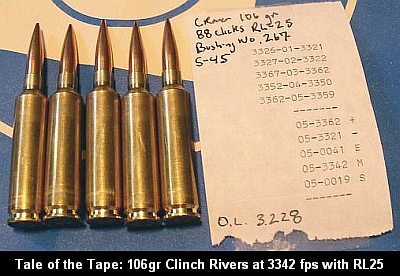 The result, typically, is rather short barrel life, sometimes less than 1500 rounds. A few folks have been experimenting with the use of very slow, cooler-burning powders. There is some evidence that the use of super-slow powders, combined with modified cleaning regimens, can result in significantly enhanced barrel life. .243 Win shooters are fortunate as Lapua, Norma, and Winchester all make good brass for this caliber. We've shot all three brands. The Lapua and Norma both yielded excellent accuracy, and both brands were very consistent weight-wise. The primer pockets did stay tight a bit longer with the Lapua, and the neck tension stayed more constant after repeated firings. Since Lapua .243 brass is usually less expensive than Norma, Lapua is our first choice. But if you find some Norma .243 cases at a good price, don't hesitate to buy them. You may have to adjust your load a bit as the Norma we tried had slightly higher H20 capacity than the Lapua brass. Domestic (Remington and Winchester) brass is significantly less expensive than Lapua or Norma. If you sort the cases by weight and clean up the primer pockets and flash holes, Win brass can shoot very well indeed. Winchester would be our first choice if you need large quantities of brass, or are shooting tactical matches where it's common to loose brass in the weeds. One Midway user observed, however: "[I prefer] Remington brass over Winchester, due to the different internal volume of the brass. Since the internal volume of Remington is smaller I seem to get more consistent results from both the chronograph and down-range performance." For varminters, the Sierra 70gr Blitz-King and Hornady 75gr V-Max offer a good combination of accuracy, BC, and explosive impact on target. The Berger 80gr Varmint bullet is exceptionally accurate but doesn't impact as explosively on target. For coyotes, the 80gr Nosler Ballistic Tip and Hornady 87gr V-Max both buck the wind pretty well and hit hard. For small to medium-sized deer, Sierra recommends its 85gr HPBT GameKing for soft-tissue shots out to 200 yards. Where deep penetration and better weight retention is required, you need bullets like the Nosler 95gr/100gr Partitions, Remington 100gr Core-Lokt? SP, or the Sierra 100gr SPFB Pro-Hunter. Click Here to download Nosler Partition Video (requires QuickTime). Hunter and outdoor writer Chuck Hawks notes: "When using the .243 to hunt medium-size big game animals, bullet selection is paramount. Rapid (but controlled) expansion is very important, as the small diameter 6mm bullet has little shocking power if it does not expand and expend its energy inside of the animal. Two bullets in the 90-100 grain weight range that have earned a good reputation on medium size big game animals are the Remington Core-Lokt and Nosler Partition." The Combined Technology 95gr Ballistic Tip (made by Nosler) is another favorite with deer hunters. South Dakotan Grant R reported: "This is a very capable, accurate bullet. I used this bullet last fall deer hunting and was more than amazed at its performance. Shot a mule deer at 512 yards with it, bullet exited, deer ran about 20 steps and that was it." Forum member Jeffrey H of Mississippi reports: "I have had very good results with the Combined Technology Ballistic Silvertip with the 95gr bullet. My son used them to take 3 deer this year and none walked away. I have also used the Barnes TSX in 85gr and have not only had excellent accuracy from these, but I took two deer using them and had very good kills with both. I guess we all know how accurate the 6mm bullets are." Mike Daly, Hodgdon's Director of Customer Service, writes: "The 243 quickly gained a reputation for being a great hunting cartridge. When coupled with H4895 and a 55gr Nosler Ballistic Tip, the 243 will deliver over 4050 fps for taking varmints. For larger varmints, the Barnes 85gr Triple Shock" X-BT bullet will deliver great performance with a max load of H4350 driving it over 3200 fps. For deer and antelope hunters, it is hard to beat the Speer 100gr BTSP powered by H4350 at over 2970 fps. For Mule Deer, [I use] a Nosler 95gr Partition bullet driven to approximately 3085 fps by a maximum load of H4350. This combination has accounted for many deer, a few antelope and even a coyote or two." With enough powder capacity to drive the 0.585 BC 115gr DTACs at 3150+ fps, the .243 Win is an outstanding long-range cartridge. 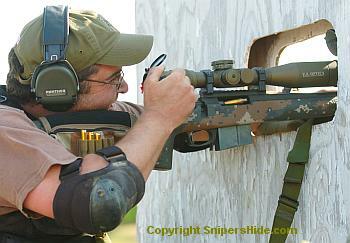 George Gardner of GA Precision recently won the long-range Shumway Cup segment of the 2006 Snipers' Hide Cup shooting a straight .243 Win. In so doing, George bested Terry Cross (.260 Rem) and David Tubb (6XC), so you can see the .243 is a top performer at long distances. In fact, in terms of Wind Drift, a .243 running 115s at 3150 fps beats both the .260 Rem (2850 fps) and the 6.5-284 (2950 fps) running 142 MatchKings. In addition to the DTAC 115-grainers, other excellent long-range match bullets include: 105gr Berger VLD, 106gr Clinch River, 105gr Hornady A-Max, 105gr Lapua Scenar, and the 107gr Sierra MatchKing. The 105 Scenars can be incredibly accurate, but their shank diameter is a few ten-thousandths less than the Berger 105s, Hornady 105s, or Sierra 107s, so the Scenars seem to work best in barrels with a fairly tight bore diameter. The Bergers like to be seated well into the lands, while the MatchKings and Scenars work well either jammed or jumped. The 105gr A-Max, with its polymer tip, is a good dual-purpose bullet that works well both for long-range paper-punching and long-range varminting. The A-Max will expand on impact while some high-BC match bullets will make an "ice-pick" wound. Matt Bianchini tells us: "I use the long-range bullets for woodchuck hunting here in PA with great results out of my 243 AI. My favorite is the Hornady 105gr A-Max piped at around 3290 fps by a 27" Shilen. Also had great success on PA whitetails." For the heavy bullets, in the 100-115 grain range, modern slow-burning extruded powders produce great accuracy with low ES and SD. 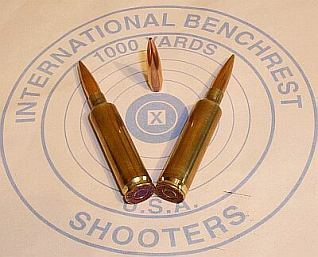 With the 105-107 grain match bullets, try H4831sc, Reloader 22, Reloader 25, and Vihtavuori N165. Sierra's recommended Hunting Load for its 100gr soft-point FB and BT bullets is 36.2gr IMR 4064 at 2900 fps. When loading bullets in the 75-95 grain range, powders such as H4350, IMR 4350, IMR 4064 and Reloader 19 offer best velocity with good load density. Many long-range varminters recommend H414 with the 87gr V-Max. For the light varmint 60-75 grain varmint bullets, you can use faster powders, such as Hodgdon Varget, H414, and Vihtavuori N140. For the 70gr BlitzKing, Sierra suggests a load of 38.6 grains N140 at 3200 fps. Maximum velocities with the lighter bullets can be achieved with ball powders such as Winchester 760 and H380. Click Here to download Sierra Bullet's complete .243 Winchester Load Map as a .pdf (Adobe Acrobat) file. With data for two dozen powders, this provides suggested loads for Sierra's entire 6mm bullet line-up from 55 to 107 grains. .243 Win For Tactical Comps We asked GA Precision's George Gardner why he chose .243 Winchester for his Tactical Comp Gun. He replied, "Why would I run anything else? Think about it. I'm sending a .585 BC 115 at 3150 fps--that'll shoot inside the 6XC and .260 Rem with ease. I'm pretty sure I have found the Holy Grail of Comp Rifles. There are no brass issues like you can get forming .260 brass. I don't have to worry about doughnuts, reaming necks--none of that. And the choice in brass is great too--run Lapua if you want max reloads and great accuracy. Run Winchester if you're on a budget, and so you won't cry if you lose some cases in a match. I can get 10-round mags, and feeding is 100% reliable, since the case is identical to a .308 except for the neck. Accuracy-wise, I don't think I'm giving up anything to the .260 Rem or the 6XC." We then asked George if he'd considered using a .243 AI instead: "Yeah, the cases look cool with that 40° shoulder, but I think the standard .243 feeds a little better. And I don't think I really need the extra performance of an improved case. Run the ballistics for my load--115 moly DTAC at 3150 fps. You've got less windage than a 2950 fps 6.5-284, with cheaper brass, cheaper dies, cheaper bullets, and less recoil." Parker Ackley reluctantly developed the .243 Ackley Improved ("AI"). Ackley finally gave in to his customers' requests to develop the .243 AI. He had always felt that the .243 Winchester was already an improved configuration, but he did say that the best thing to be gained by improving the .243 Winchester was to substantially reduce the case-stretching problems. The .243 Winchester parent case has always stretched brass, almost as bad as the Swift. Even though you get more velocity with the improved .243, I've also found that the improved version gives a bit more throat life than the parent case does. The .243 AI delivers more velocity by virtue of enhanced case capacity--roughly five grains more H20 capacity than a standard .243 Winchester. The .243 AI has a water capacity of approximately 57 to 58 grains, compared to 52-53 grains for the standard .243 Winchester. I'm often asked, "what gunpowder do you recommend"? I generally recommend medium-slow or slow burn-rate powders for the .243 Ackley. I have found, with my rifle, that H414 is pretty much my first choice for use in the .243 AI. H414 tends to give me great accuracy, with good velocity. Saying this, I have tried many other propellants and have found the following powders to be worth looking at for your needs: AA-2700, H414, H4350, VV N150, VV N550, VV N160, VV N560, RL19, H4831sc, and VV N165, to name a few of the powders that I have tested over the years. One thing that you need to watch for is what version of the .243 Improved that you have. This depends, for the most part, on whose reamer you will be using for the chambering of your barrel. 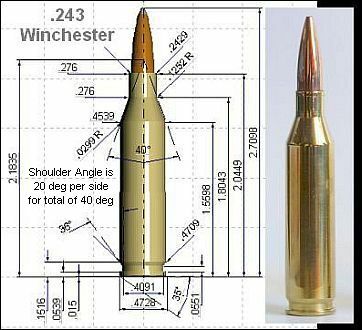 It is easy to determine if your .243 Improved is the .243 Ackley Improved, or the .243 Winchester Improved. 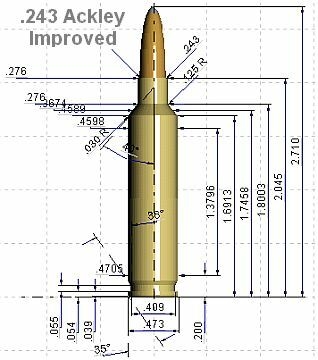 If you have the .243 Ackley Improved, the shoulder-body section will measure .460" dia. at this point. If you have the .243 Winchester Improved, the shoulder-body section will measure .455" diameter at this point. Both cartridges have the 40-degree shoulder. I have used both versions and found that you can use any data developed for either version interchangeably. The .243 Ackley Improved is one of the best long range varmint rounds going, and can add some extra punch for your light big game rifle as well. One would be hard pressed to ignore a cartridge as versatile as the .243 Ackley Improved. In a long-range varmint rifle, speed kills. Ultra-high velocities deliver flatter trajectories and more explosive hits. And that's where the .243 Ackley really shines. While we don't advocate "pushing the limits" with factory actions, Matt Bianchini has explored the upper limits of .243 Ackley performance with his Farley-actioned long-range rig, fitted with a 29" Lilja 3-groove, 8-twist barrel. Using a stout load of Reloader 25, Matt's "Screamin' Yellow Ackley" has topped 3340 fps with Clinch River 106s. That is serious speed for heavy 6mm bullets. This shows a well-built .243 AI leaves Dashers and 6XCs in the dust when it comes to pure velocity. Since the .243 Win is such a popular cartridge, all the major die-makers offer reloading dies. It's hard to go wrong with a Redding Type 'S' Full-length bushing die--item 77114 for the standard .243 Win and item 77420 for .234 AI (40?). This will both resize the case (and bump the shoulder) as necessary, and allow you to adjust neck tension with bushings. Alternatively, you can go with a body die (item 75114), and a separate neck bushing die (item 71114). If you load primarily one brand of bullets, another slick set-up is to buy a Forster full-length .243 sizing die, and then send it off to Forster to have the neck honed for your desired amount of tension. Forster charges just $10 plus shipping for this service. This elegant one-pass sizing solution produces very straight rounds with low run-out. We also believe that doughnuts (in the neck) form less readily if you full-length size with non-bushing dies as opposed to using bushings. Bushing dies leave a little bit of the neck unsized, and that's where the brass can build up. For bullet seating, both the Redding Competition Seater (item 55114) and the Forster Ultra-Seater (item U00034) work great for the standard .243 Win case. If you shoot a .243 Ackley, Redding's .243 AI Comp Seater (item 55420) costs quite a bit more than the standard version and Forster doesn't list a .243 AI seater in their catalog. However, you can just run your chambering reamer into the inner sleeve of either die to fit the Improved case. If you want the "Cadillac" of production seater dies for the .243 Win, order the Wilson Stainless Micrometer seater (item 50-1114S) from Sinclair International. Costing only a few dollars more than a Redding Comp seater, this die is a joy to use, providing very positive control over bullet seating depth. When used with a quality arbor press, the Wilson offers unrivaled "feel" for bullet-seating force. This can help you monitor neck tension, one of the most critical factors in maintaining low ES and SD for long-range accuracy. The Model 700 VLS represents one of the better values in the current Remington Line-up. The VLS offers a matte blued action with 26" heavy barrel (1:9/125" twist) with target crown. The laminated stock includes Monte Carlo cheekpiece, and a wide, flat, beavertail fore-end for stability in front bags. Suggested retail for the Rem 700 VLS is $951.00, with street price around $750.00 in .243 Win. Long-favored by serious varminters, the Savage 12-BVSS is ready-to-run right out of the box. With a strong, pillar-bedded laminated stock, and fluted 26" heavy barrel in 1:9.25" twist, the single-shot 12-BVSS can often deliver 1/2-MOA groups with tuned handloads and can easily shoot under 1 MOA with factory ammo. The crisp, AccuTrigger" can be adjusted down to about 1.5 pounds, so all you really need is to skim-bed the action and add a scope and you're ready for the varmint fields. MSRP for the 10-pound BVSS is $746.00, with street price under $630.00. NOTE: This rifle is not available in the 2008 Savage product line, so you'll have to look for older inventory. The Howa 1500 Varminter Supreme is an excellent rifle for the price. You can often find the laminated Howa varminters for under $600.00 (MSRP is $711.00). The Varmint Supreme features a sturdy and very comfortable laminated stock with vent holes for barrel cooling. The action is strong and smooth, and the barrels are probably a bit better, on average, than you'll get from Remington. IMR 4895 44.7 WLR 58 V-Max 3819 fps IMR Max Load. 2.600" COAL. Win 760 45.4 Fed 210m 70 Sierra BlitzKing 3400 fps Sierra Max Vel Load. 2.670" COAL. Reloader 19 44.5 WLR 75 V-Max 3300 fps Accurate, but more speed possible. Blitz 3100 fps Sierra recommended Hunting Load. 2.635" COAL. TSX BT 3306 fps Hodgdon Max. Fine hunting load. 2.560" COAL. GameKing 3220 fps Great Do-it-all game/varmint load. 1/2 MOA at 200m. IMR 4064 37.1 Fed 210m 87 Hornady BTHP 3100 fps Chuck Hawks' general purpose load. H4831 42.0 WLR 100 Speer SPBT 2924 fps Hodgdon Factory Max. 2.650" COAL. H4350 41.0 WLR 95 Nosler Partition 3085 fps Mike Daly (Hodgdon) Mule Deer Load. Near Max. Reloader 22 41.7 WLR 100 Sierra SPBT 2950 fps Alliant Factory Max. 2.70" COAL. H4350 37.4 CCI BR2 107 SMK 2986 fps CW2's Acc. Load--just off lands. VV N165 44.5 CCI BR2 115 DTAC 2960 fps JoeH's Acc. Load--2950-2970 best with all powders. VV N170 47.5 CCI BR2 115 DTAC 2960 fps JoeH's Load--2950-2970 best with all powders. Reloader 25 47.5 Fed 210m 115 DTAC moly 3150 fps George Gardner's Tac Match Load. NOTE: Safe for Moly only! 2.860" COAL. IMR 4895 41.5 CCI BR4 68 Berger MEF 3630 fps 1/4-MOA at 100, .005" into lands, Hart barrel. BallTip 3760 fps Bob Blaine load. Norma brass. BallTip 3650 fps Chino69 AI load. 1/2-MOA at 200. .010" into lands. H4350 46+ Fed 210m 80 Berger Varmint 3550 fps Chino69 AI load. 1/4-MOA at 200. .010" into lands. IMR 4350 44.7 Fed 210m 87 V-Max 3237 fps Excellent accuracy in Pac-Nor barrel, jumped .020". VV N160 44.0 WLR 87 V-Max moly 3200 fps .4" groups in Shilen 1:10" barrel. Scenar 3400 fps AlBoy's load. .3" at 200 yds in Pac-Nor 1:10" barrel, .274" neck. HOT. BallTip 3142 fps .4" groups in Schneider barrel. Low ES/SD. H4831sc 44.0 WLR 100 Nosler Partition 3050 fps Decent Accuracy in Pac-Nor barrel. Low ES/SD. Reloader 25 47.5 Fed 210m 106 Clinch River 3340 fps MattB load. Caution: HOT load, but very accurate in 29" Lilja 3-groove. H4350 41.6 Fed 210m 107 SMK 3036 fps JimB load. Extremely Accurate with SMKs jumped .040" in Schneider barrel. H4831sc 47.2 Russian 107 SMK 3238 fps Chuckhunter load. Accurate and repeatable. Jump .007". Sub-inch at 300 yards. Near max. WARNING: ALWAYS start 10% below these loads and work up. Pressures can vary dramatically from one barrel to another. Seating depths have a huge effect on case pressures--moving the bullet just .015" one way or another can push a "safe" load into the danger zone. Powder lot variances can be extreme--you may have to adjust a full grain or more. Whenever you buy new powder, even the same brand, start 10% low. NEVER assume pressures will be safe if you change lots or ANY component. Case web growth is probably the most reliable indicator of over-charge. By the time you're getting stiff bolt lift or ejector marks with fresh brass you've exceeded proper pressure levels. Ambient temperatures can alter pressures considerably. Don't assume cold weather loads are safe in summer. As you approach max loads, reduce the load increments. Just 0.2 grains can make a difference. .243 AI 115 DTAC 3200 8.32" | 4.08" 57.15" | 17.57" 218.6" | 54.8"
6XC 115 DTAC 3040 9.67" | 4.41" 64.82" | 19.01" 247.2" | 59.5"
6mm Dasher 105 Berger VLD 3030 9.92" | 4.85" 67.33" | 21.24" 262.7" | 67.4"
6mm BR 105 Berger VLD 2920 10.91" | 5.08" 73.33" | 22.35" 286.0" | 71.4"
Drop and Wind-Drift calculated with Point-Blank Software for 70° F temp, and 1000' altitude. BCs were 0.585 for 115 DTAC, 0.535 for Berger 105 VLD. Milender's .243 Ackley Improved Page Comprehensive 243 AI Load Data. Hundreds of recipes, covering virtually all powder/bullet combos. The .243 Winchester by Jim Baker SavageShooters.net Varmint and LR .243 Reload Guide. Reloader's Bench .243 Winchester Page Cartridge history with recommended powders. The .243 Winchester by Chuck Hawks Recommended loads for varmint and big game hunting. Gunner's Den .243 Winchester Page Cartridge basics and external ballistics. Copyright ? 2006, AccurateShooter.com | 6mmBR.com, All Rights Reserved. Topics: .243 Winchester, .243 Win, 243, 243AI, 243 Ackley, .243 Ackley Improved, .308, .308 Winchester, 308 Win, Reloading, Bullets, Lapua, Norma, Winchester, Remington, Speer, Hornady, TripleShock, X Bullet, Partition, Nosler, Sierra, MatchKing, Blitz, BlitzKing, V-Max, Vmax, hollow point, boattail, boat-tail, BT, HPBT, powder, gunpowder, H414, Varget, H4350, H4831, H4831sc, IMR, IMR 4064, IMR 4350, H-1000, H-414, Retumbo, Reloader 19, Reloader 22, Reloader 25, Vihtavuori, N160, N-160, N165, N-165, N170, N-170, N560, N-560, brass, Load Map, Reloading Recipes, WLR, CCI Primer, CCI BR2, Federal Primer, Fed 210, 210m, Savage 12-BVSS, Accutrigger, Remington 700, VSSF, VSSF-II, Howa 1500, Varminter Supreme, factory .243.